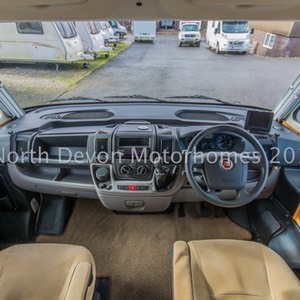 The V5 ( log book ) stating just 2 former keepers and the speedometer showing just over 25,000 miles. 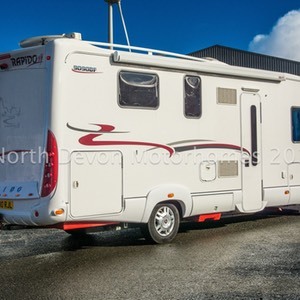 Good mechanical service history with a recent cam-belt and water pump change, not to mention some news tyres etc. 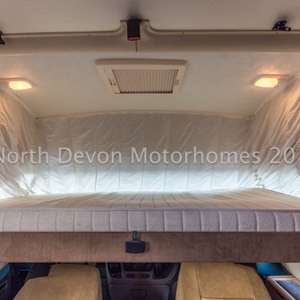 Having a desirable layout, such as, an Island bed above a good sized garage, a superb L-shape lounge that incorporates the large A-Class cab, this can only lead to one problem, " Sort after and high in demand " plus the fact that I would very much like to keep it for myself. 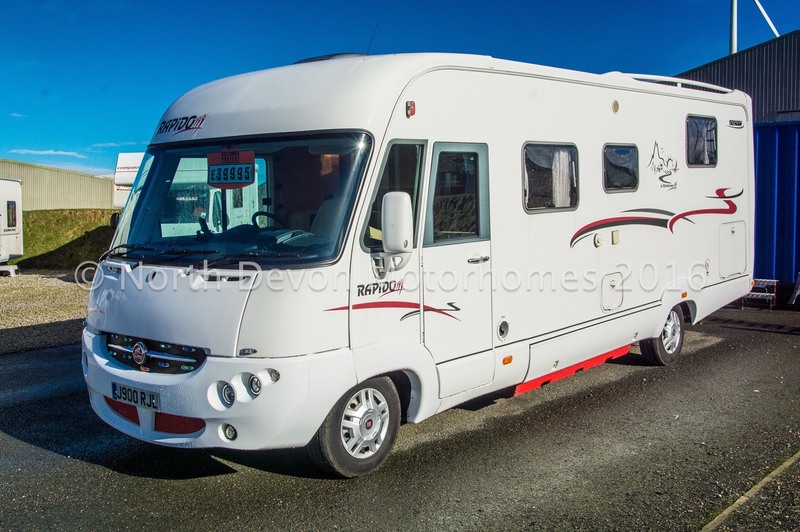 Fiat Ducato 130 JTD Multi-Jet, 130 BHP ( Euro 4 ) six speed gear box. 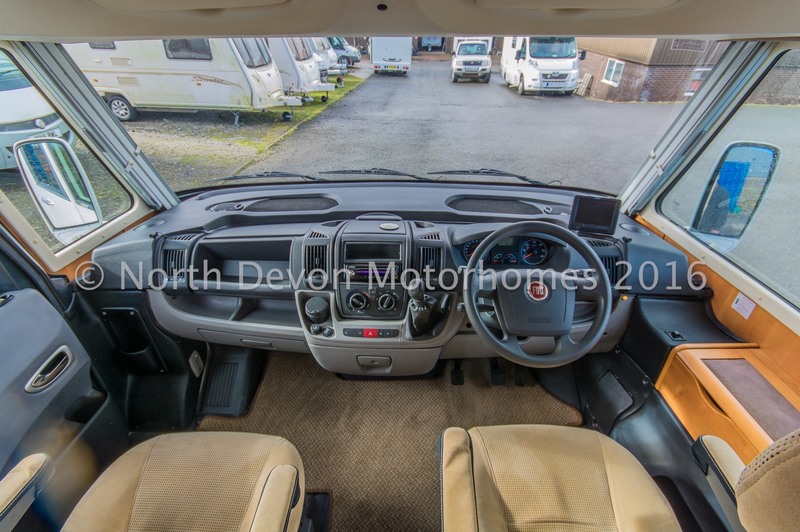 Cab air-con, cruise control, PAS, drivers airbag, Electric window ( NS ), Electric mirrors, front windscreen and cab side window built in blinds, stereo and captain seats. 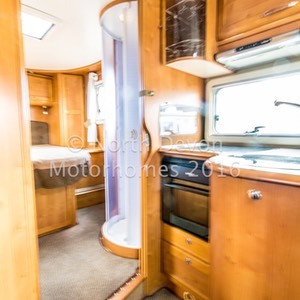 Rear Island bed over garage, separate shower and washroom, central kitchen, front L shape lounge with drop down bed. 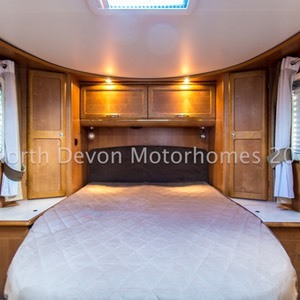 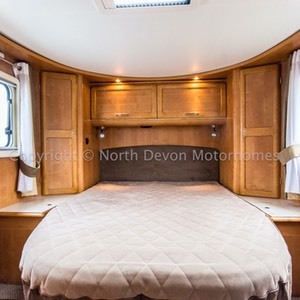 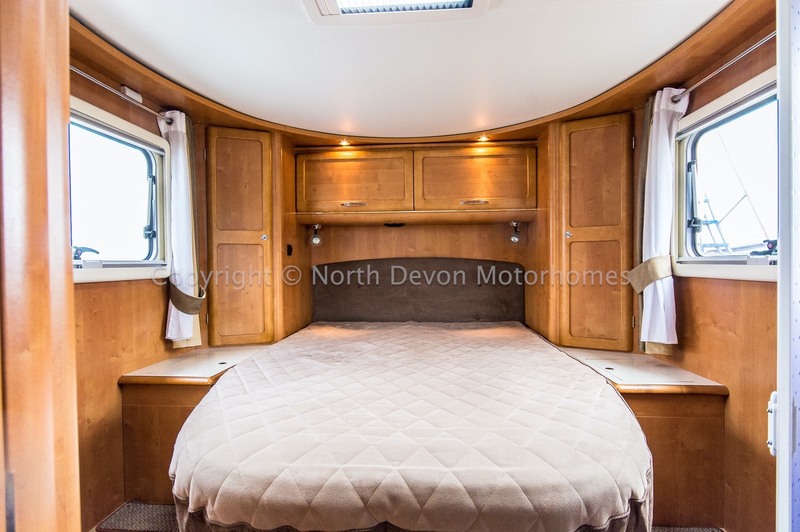 4 berth, with rear double island bed, further large drop down double bed above the cab. 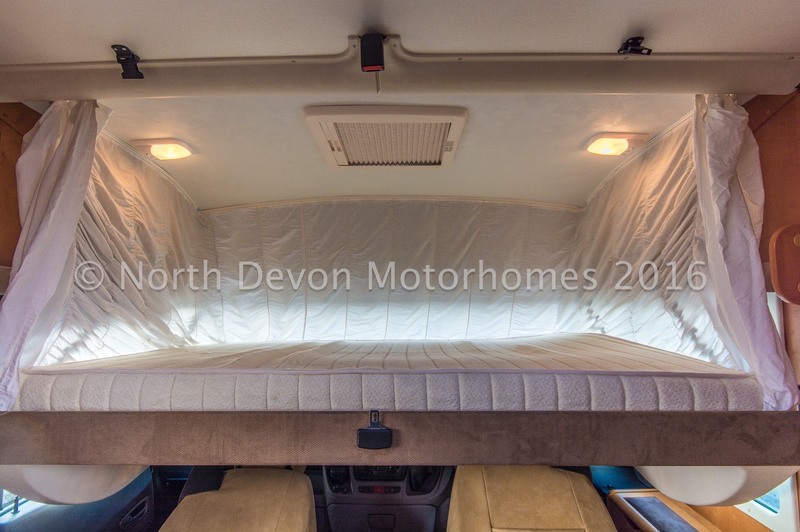 4 x 3 point seat belts in total. 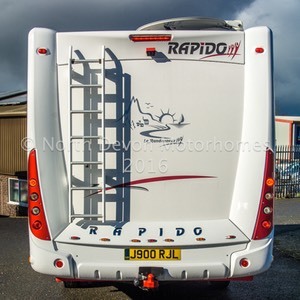 Can be closed off/ separated by sliding door panel. 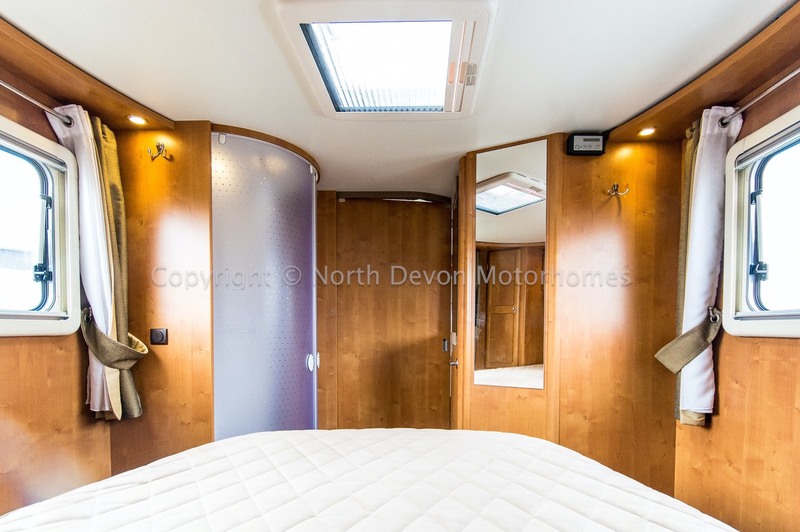 Incorporating a generous Island bed with overhead lockers and his and hers wardrobes. 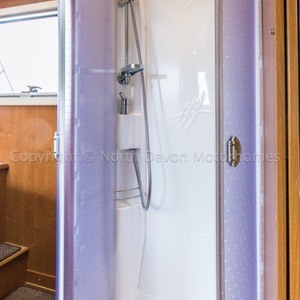 When the door panel is pulled shut, this in turn incorporates the separate shower cubicle and WC/Washroom. 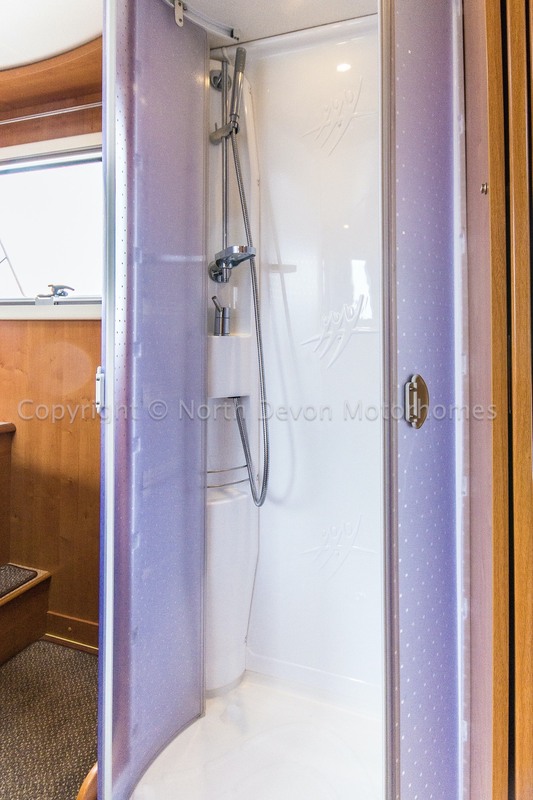 Separate shower cubicle with 12 volt spot lighting and vent. 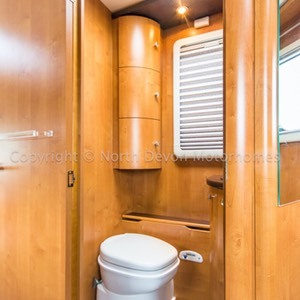 Washroom has a swivel based cassette toilet, chrome sink with built in under storage cabinet, and opposing high level cabinet. 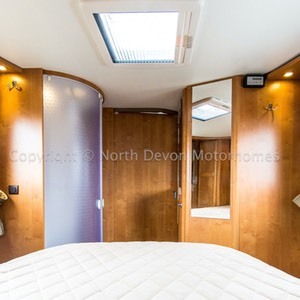 Skylight and window with hot air heating point, 12 volt lighting, etc. 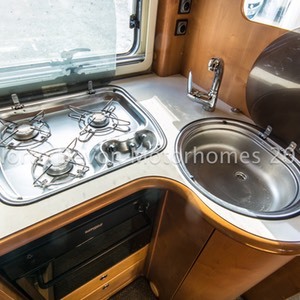 3 burner hob, oven with grill, sink, large 3-way fridge with separate freezer, cocktail cabinet, extractor, ample low and high level storage, and window. 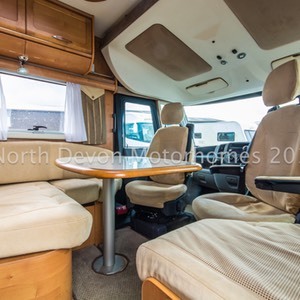 Superb, L shape lounge with opposing seat, with a multi positionable table layout. 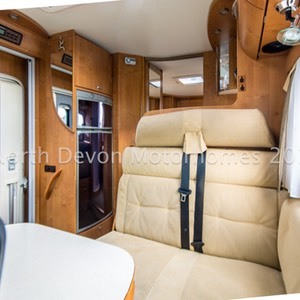 large Heki roof light helping to provide natural light and cab captain seats that swivel into this superb lounge providing the opportunity for multiple dinning and lounging options. 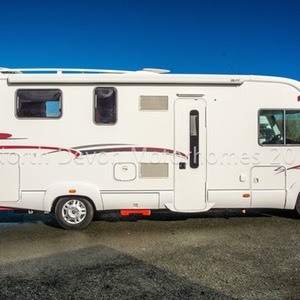 TV station and ample low and high level storage. 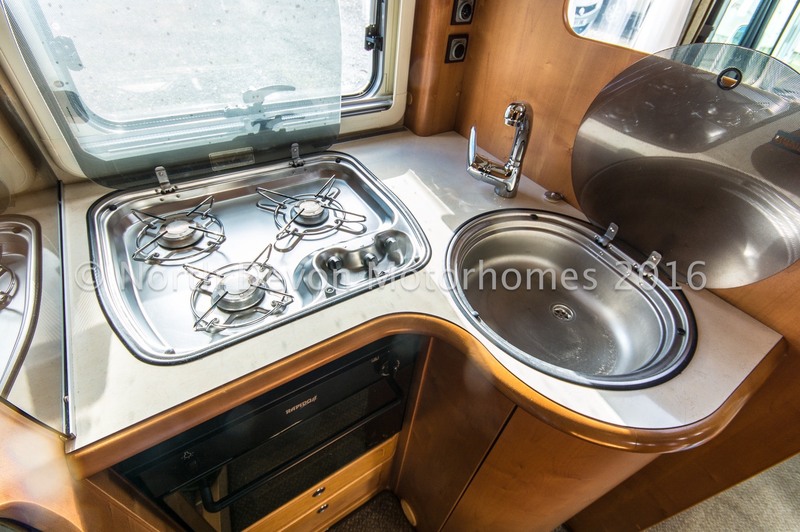 Truma boiler providing hot blown air heating throughout and hot water to both kitchen sink and washrooms. 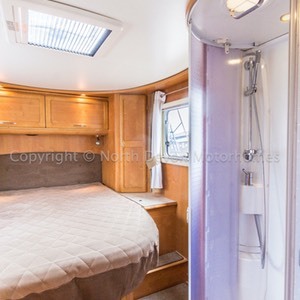 Working on either LPG or 240 volt mains hook-up. 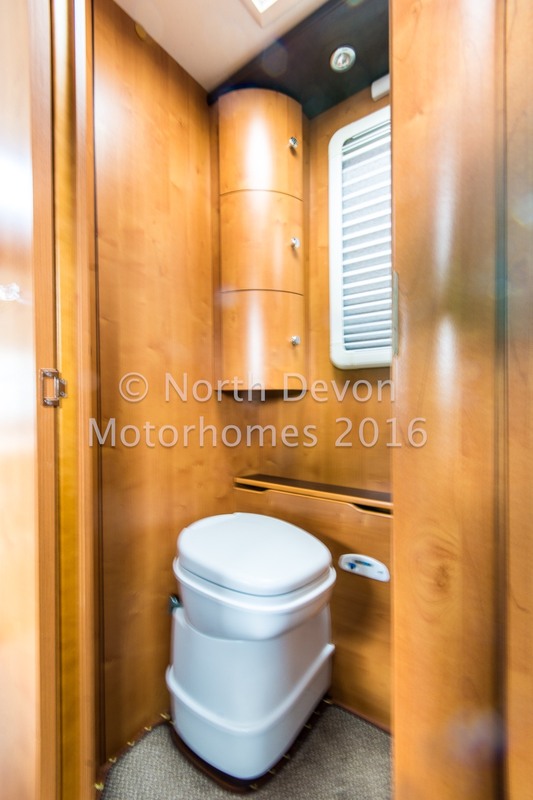 On-board fresh and waste tanks. 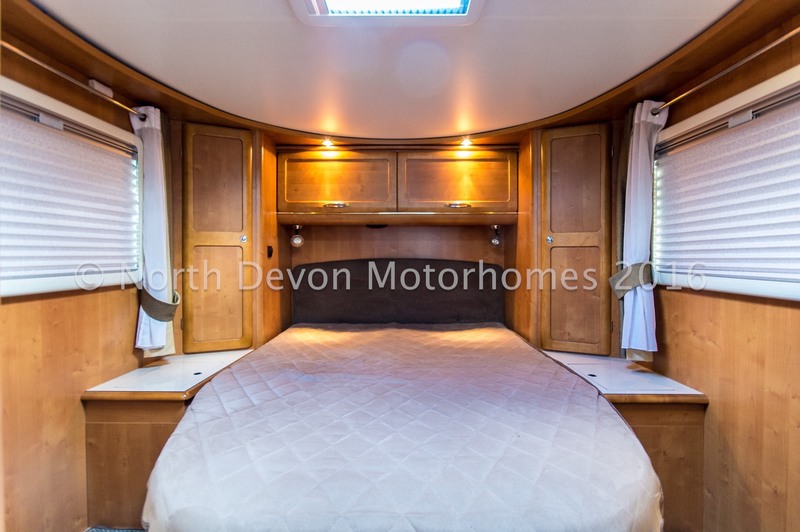 Large garage with dual access doors, 2 x outside wet lockers, ample internal lockers cupboards, wardrobes, providing a good degree of low and high level storage. 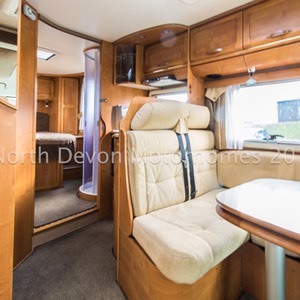 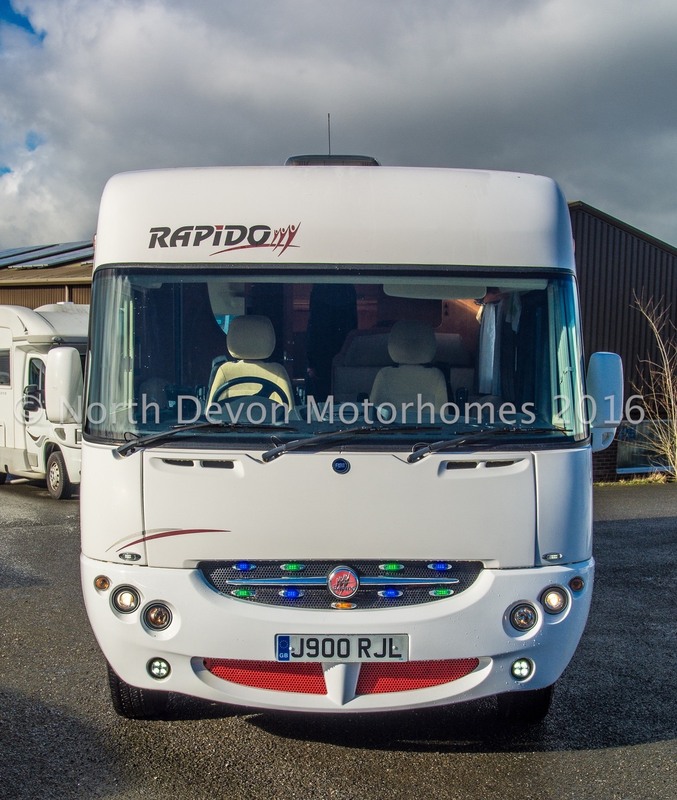 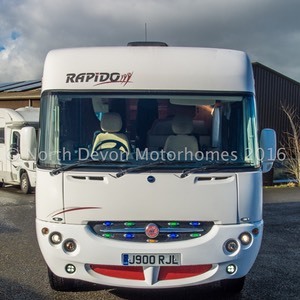 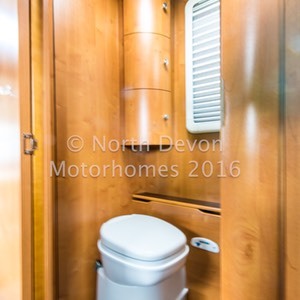 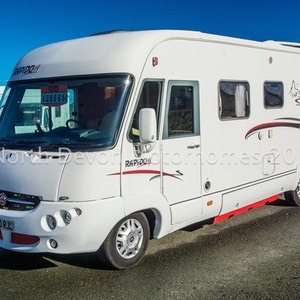 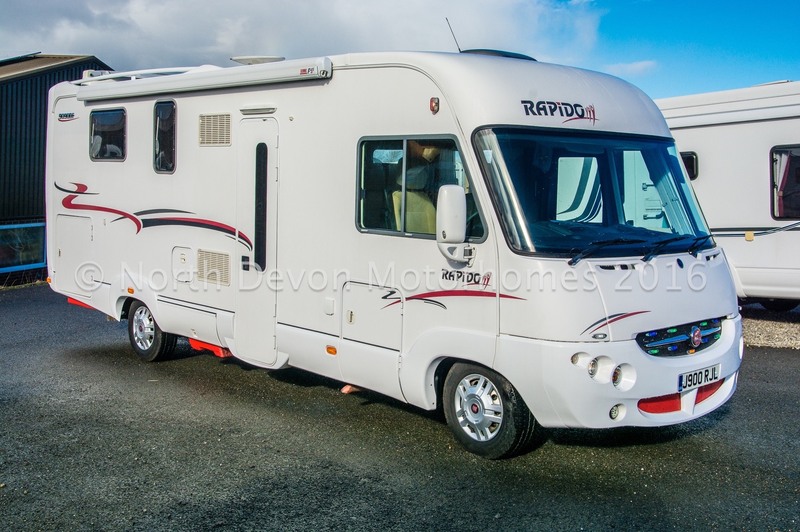 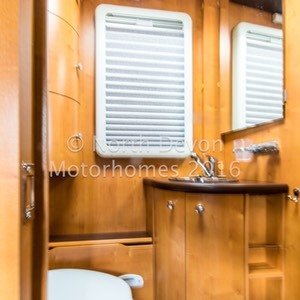 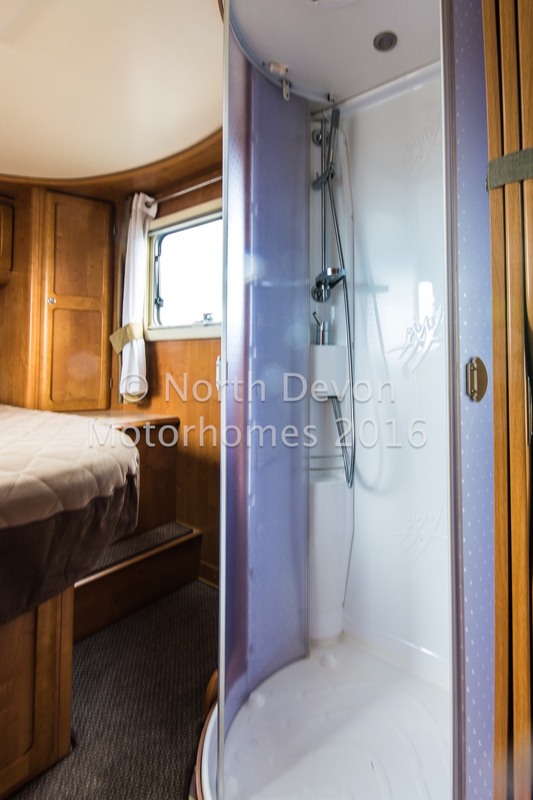 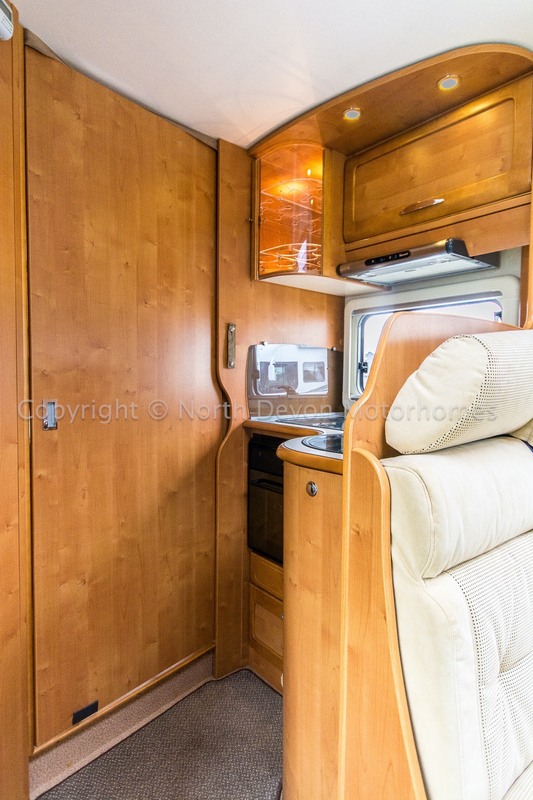 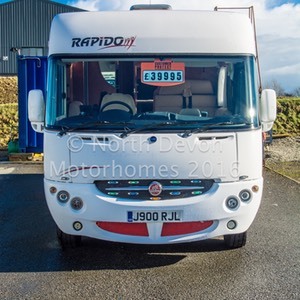 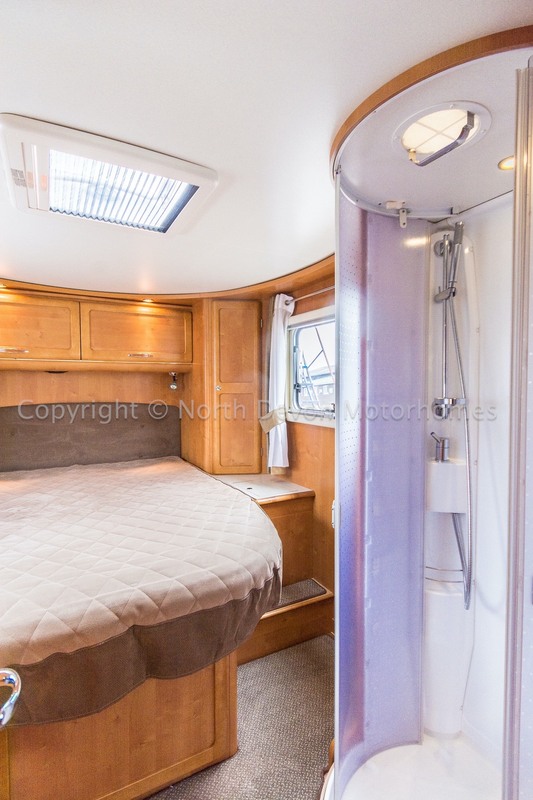 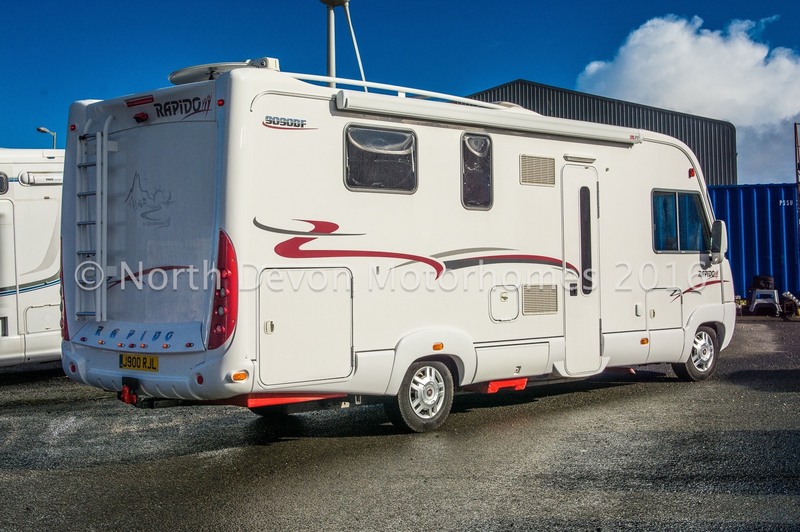 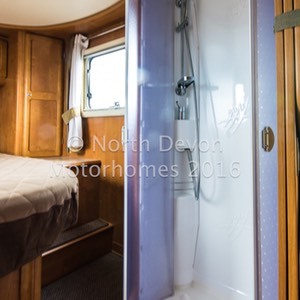 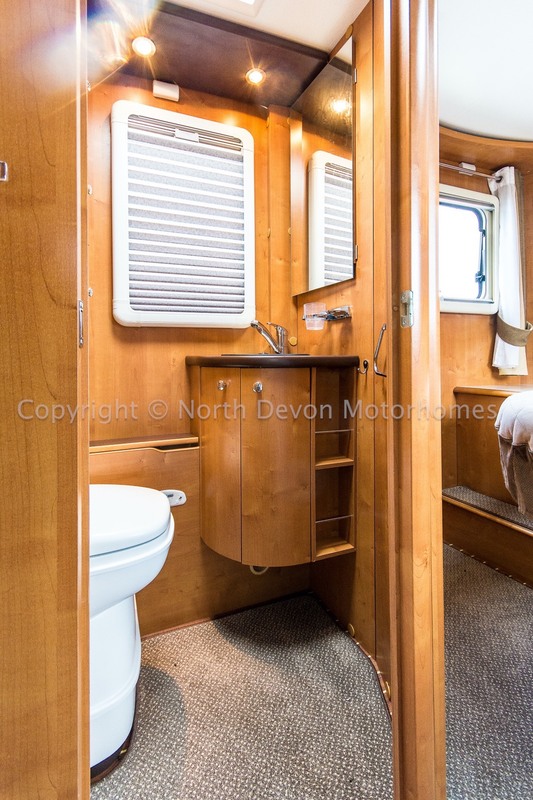 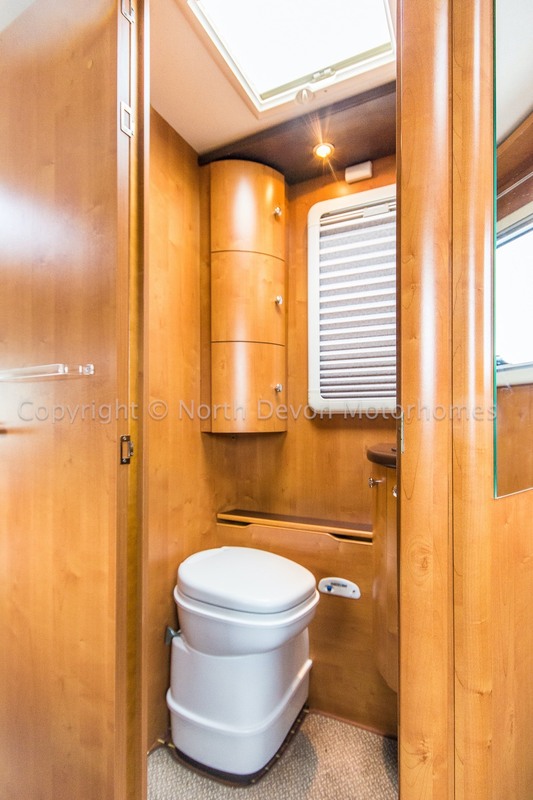 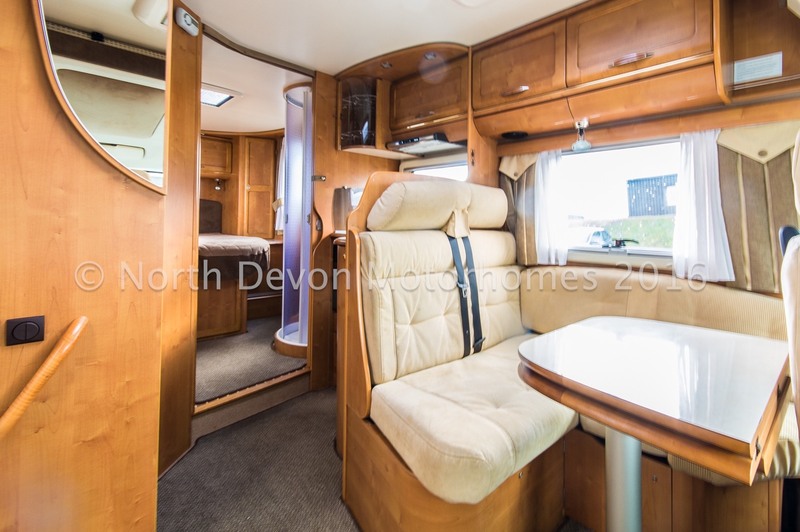 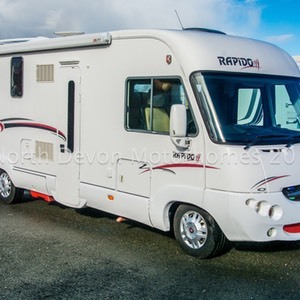 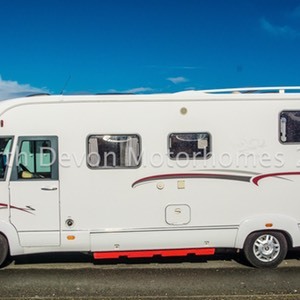 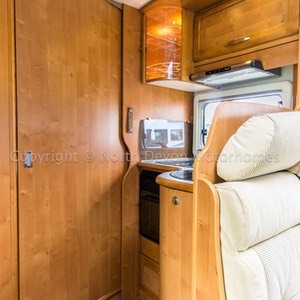 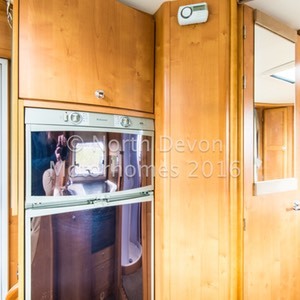 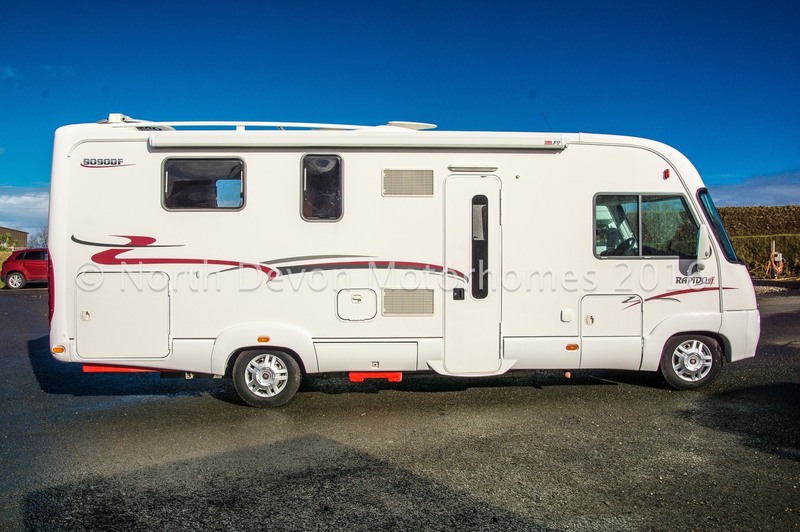 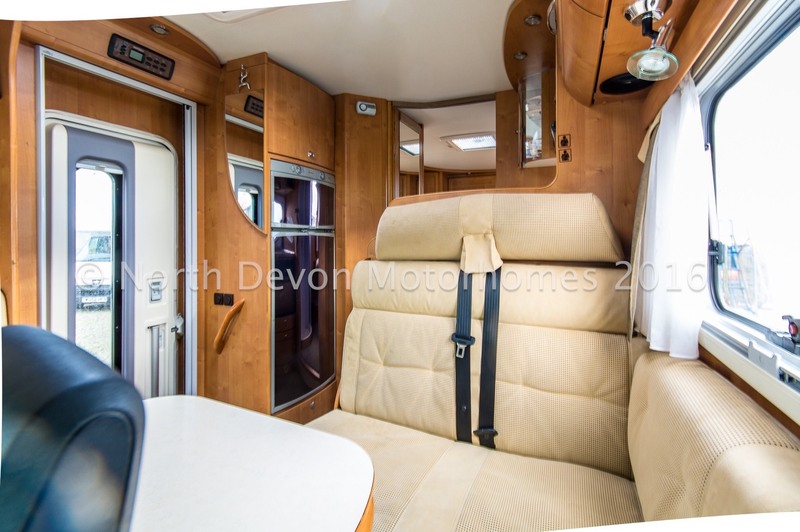 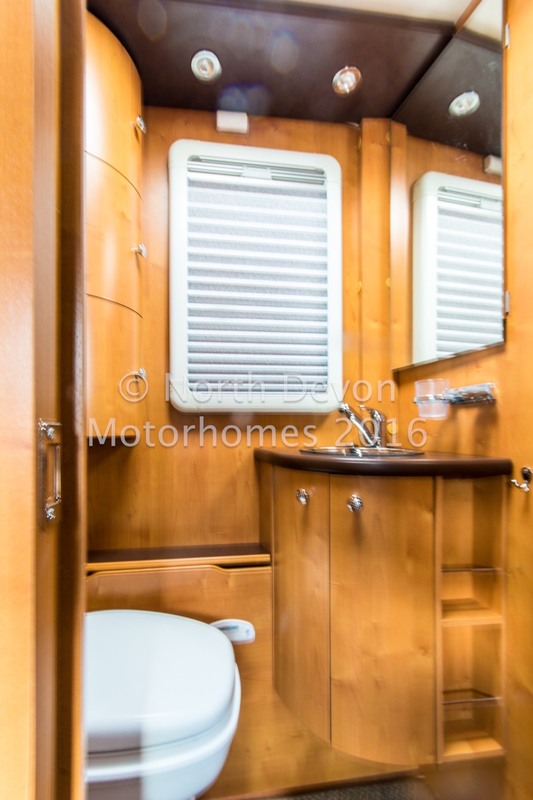 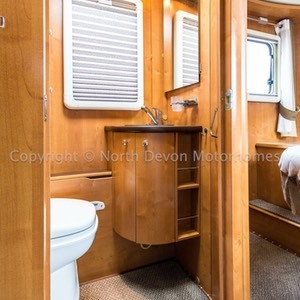 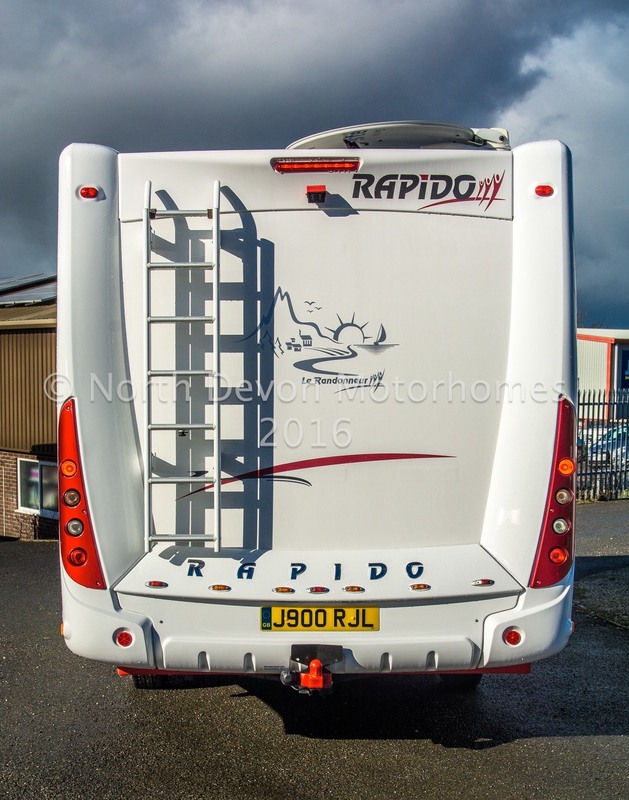 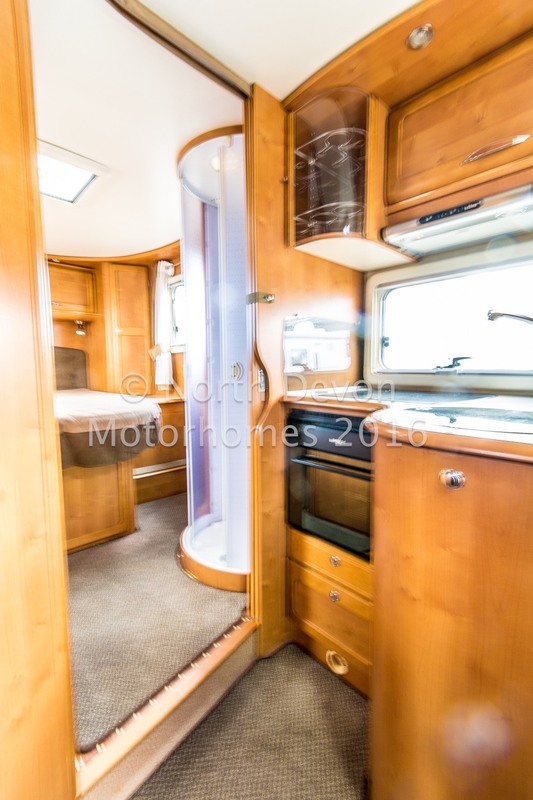 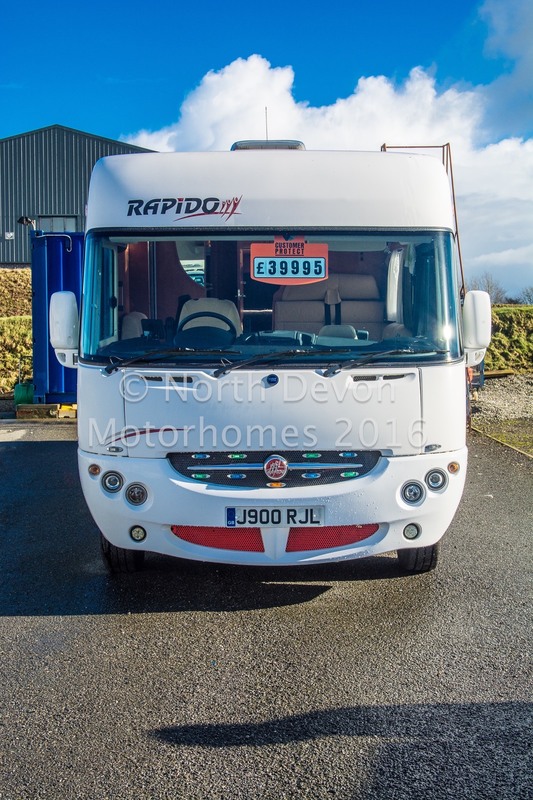 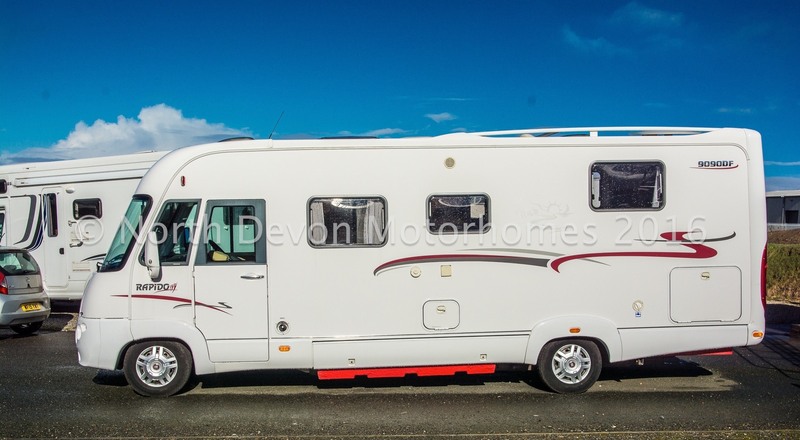 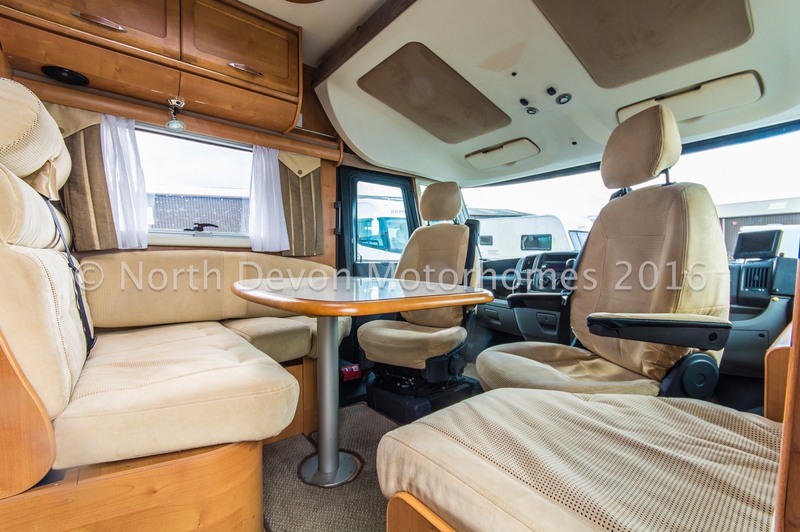 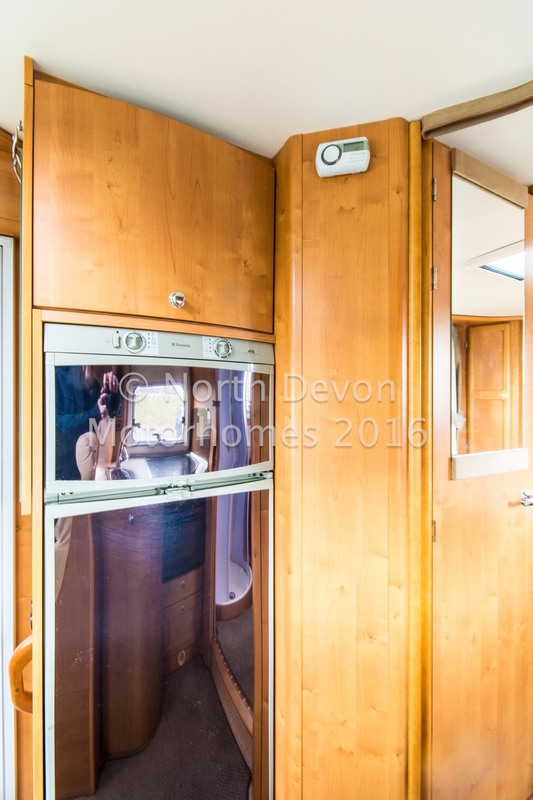 TV, Sat, Stereo, Reversing camera, Cruise control, Cab air-con, Electric window, Electric mirrors, Tow-bar, Rear ladder, Awning, Gaslow refillable bottles, External BBQ point, External shower point.